Seoul Selection wishes you all a very happy Lunar New Year and all the best in the Year of the Sheep. Here are some ideas for things to do during the long holiday. Check out artist Kim Mi-gyeongâs exhibit of drawings of Seoulâs Seochon neighborhood at Seochonâs very own Gallery Ryugaheon. Kim lived in Seochon as a college student and again for three years after spending seven years in the United States. Climbing up on rooftops in the neighborhood, she drew inspiring views of its tile-roofed homes, old brick villas and beautiful mountain vistas. Nestled in the foothills of Mt. Inwangsan, Seochon is a space where the Joseon Dynasty, Japanese colonial era and modern times coexist. With tourists now flooding into the neighborhood, it is changing rapidly – remnants of the past are disappearing almost daily. Kimâs drawing are a record of both the neighborhoodâs past and its present. GETTING THERE: From Exit 4 of Gyeongbokgung Station (Line 3), walk toward the palace and swing a left on Hyoja-ro (i.e., the road that runs along Gyeongbokgung Palace towards Cheong Wa Dae). When you reach Hyoja-ro 7-gil, the alley just before Boan Yeogwan, swing another left. The gallery is towards the end of the alley on the right. Why do polls show Koreans to be so unhappy? Are illegal tour guides misleading Chinese tourists? Insa-dong’s Sool Gallery: everything you wanted to know about Korean booze. A crowd-sourced film shows Seoul in its entirety, warts and all. Korean street photographers to follow on Instagram. A beautiful morning in Muju. Seoul from the Seongsu Bridge. Oh my, the flowers are already blooming at Tongdosa. A seagull takes off at King Munmu’s watery tomb. Mary Shellyâs classic horror novel âFrankensteinâ (1818) was first adapted for stage in 2011, premiering at the Royal National Theatre with Oscar-winning director Danny Boyle at the helm. The two lead roles in the production — Dr. Victor Frankenstein and the Creature — were played by a pair of actors who have both had turns playing Sherlock Holmes on screen: Benedict Cumberbatch, known from the U.K.âs hit series âSherlock,â and Jonny Lee Miller, who plays the great detective on the American show âElementary.â The two performers shared their win for Best Actor at the 2012 Olivier Awards for their outstanding portrayal of the tragic characters in the play. Due to its great critical acclaim, the production was broadcasted in cinemas around the world as part of the National Theatre Live program, and will be screened for the first time in Korea at National Theater of Korea. Italian painter Giorgio Morandi (1890-1964) specialized in still life and landscape scenes, producing works that have gained renown for their subtlety and simplicity. Rather than being swayed by popular philosophies and techniques at the time, Morandi quietly and methodically practiced his own investigation into the metaphysical nature of the objects he encountered every day — items such as bottles, vases and books. So dedicated was Morandi to the visual shape and forms of his subjects, he is known to have taken extensive measures to remove anything that would distract from the composition, including the labels or other unnecessary decoration. The exhibition features 40 pieces of Morandiâs work, and will also display works of Morandiâs Korean contemporaries. This presentation by lawyer Ann Park will initially discuss how child maltreatment is viewed in Korea, especially in its cultural context, and provide background statistics and information related to child maltreatment. It focuses on providing an overview of Koreaâs child protection system and an analysis of the new law, the Act on Special Cases Concerning the Punishment, etc., of Crimes of Child Abuse. DATE: Feb. 27, 7PM. RSVP by Feb. 25. The Susubori Academy is devoted to the instruction of proper brewing techniques and offers beginner courses as well as an advanced master brewers course (available to those who have completed the intro class). This introductory class is specially organized for members and friends of the RASKB. The cost of the class covers instruction, supplies, and a bucket of hand-made magkeolli for each participant. The class size is limited to fifteen people maximum and will be held if a minimum of 8 people have signed up for it by March 2. 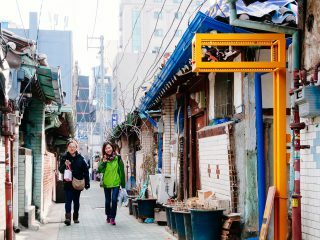 An old alleway in Ikseon-dong. Photographed by Robert Koehler. Ikseon-dong SEOUL Weekly: SEOUL March Issue Released!